Here is a typical display of mild steel brackets produced in our factory in Fareham, Hampshire, UK. Manufactured in house by laser cutting and CNC bending direct to our customer’s own designs. Understanding just what can be achieved with laser cutting and CNC bending then leave it to V and F Sheet Metal! We have decades of experience in sheet metal working from producing simple angle brackets right up to complex electronics fabrications. These mild steel brackets were laser cut from 6mm thick plate and used to support heater units in a shopping centre. Looking for more images of sheet metal brackets to give you some ideas for your design follow this Pinterest Board. We have hundreds of examples of past sheet metal projects on our Pinterest Boards and gallery pages within our website, help yourself! 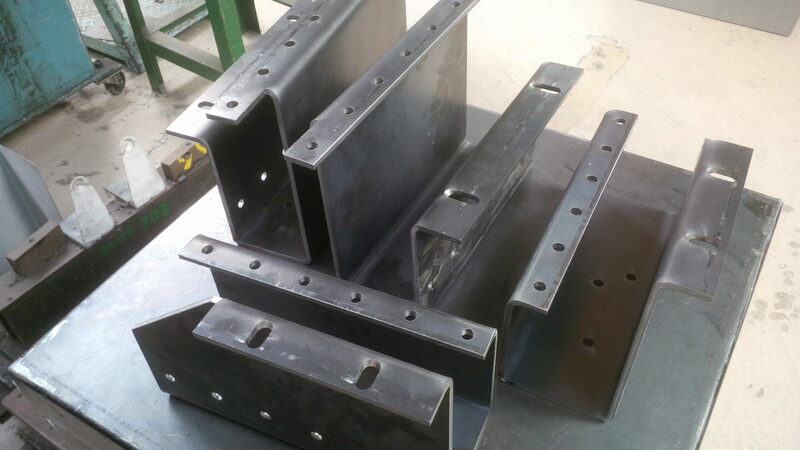 If you have a need for mild steel brackets please give us a call and our engineering team will be happy to help you. With lots of standard CNC press brake tooling on the shelf we can move on your projects straight away. Try us.